These cute popsicle puzzles can be used in a variety of ways to make learning more exciting. Here are just a few examples. Use you imagination to create what works for you. Choose a matching popsicle piece of another color to find partners. Match the number and the number word to figure out what group you are in. Group from 1-6 by color. Group from 1-6 by number. 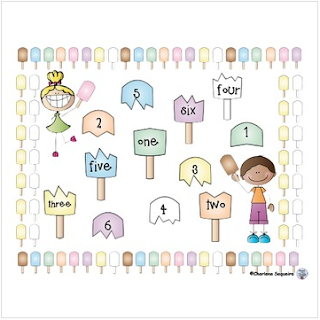 I have included 6 popsicle puzzles of each color. I have also included the complete popsicle of each color for making headers or group/team cards. There are 7 colors and a black and white set which could be printed on colored card stock. I would suggest laminating the pieces so that they last longer and they can be used again. Here are some of my other Back to School products.